Michael Jeffrey Jordan was born February 17, 1963 in Brooklyn, New York and his family moved to Wilmington, North Carolina when he was just a toddler, where he grew up and went to school. Michael was the fourth of five children of Deloris and James Raymond Jordan, three brothers and two sisters. Michael Jordan’s idol as a child was Magic Johnson and his own nickname was “Magic Jordan” as a result. He even had a license plate with this nickname on it on his first car — a 1976 Grand Prix. His father and his father’s grandfather both stuck their tongues out when concentrating and working and Michael learned to do the same thing. In fact, his dad was his first basketball trainer. A tragic incident in his childhood led to a lifetime phobia of water. He witnessed a good friend get sucked into the ocean’s undertow and drown. Then when he was eleven, he himself almost drowned while at baseball camp. To this day he is not comfortable on boats and around large bodies of water. At Emsley A. Laney High School in Wilmington, NC he played three sports: baseball, football and basketball. Contrary to legend, Jordan wasn’t cut from his high school team. He actually tried out for the varsity basketball team as a 5’11” sophomore and wound up passed over in favor of his friend Leroy Smith who was 6’7″. (Laney was in dire need of tall players.) He was placed on the junior varsity team instead. The true part of the slighting legend is that Jordan used this perceived “slight” as motivation to work hard to improve and he also grew four inches before starting his junior year. His father was known to say that Michael was born competitive and the person he tried to best the most was himself. Before he began his senior year of high school, his father advised him to be a mechanic because those who worked with their hands always had a good job. Then Jordan had a breakout senior year in basketball and his future changed course. As a senior averaging a triple-double (29.2 points, 11.6 rebounds, and 10.1 assists) he was selected to the McDonald’s All-American Team. In 1981 Jordan enrolled in the University of North Carolina at Chapel Hill on a basketball scholarship, majoring in cultural geography. He helped his team win the NCAA Division I championship in 1982 and scored the final basket needed to win against Georgetown University. Before Jordan’s enrollment, the North Carolina Tarheels’ last national championship had been in 1957. Jordan was named the NCAA College Player of the Year in both 1983 and in 1984. Jordan was selected as a member of the U.S. Olympic basketball team for the first time in the summer of 1984. The team won the gold at the Los Angeles games that year. One year short of graduation, Michael Jordan was chosen third overall in the NBA 1984 Draft. He joined the Chicago Bulls in 1984. The 1984 contract (over seven years) of the rookie third overall draft pick with superhuman leaping ability was worth $6.15 million. Jordan scored an average of 28.2 points per games and helped the Bulls make it to the playoffs. He received the NBA Rookie of the Year Award in 1985 and was also selected for the NBA All-Star Game. He was off to a great start. Jordan is credited with starting the baggy basketball shorts fad. He required bigger shorts because he wanted to continue wearing his University of North Carolina Tarheel shorts beneath his Chicago Bulls uniform during each game. Soon Jordan emerged as a basketball league star and he entertained the fans with his prolific scoring ability. His high leaps, demonstrated by performing slam dunks from the free throw line during slam dunk contests, earned this talented player the nicknames “His Airness” and “Air Jordan”. 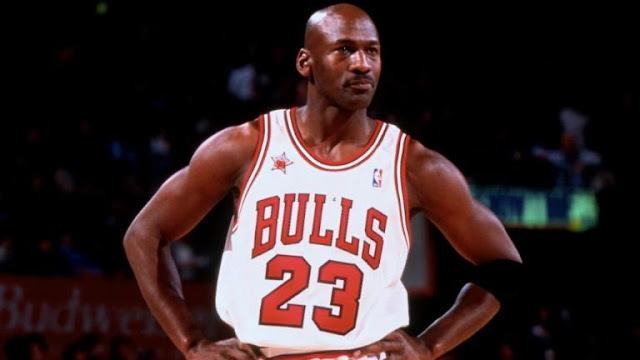 Jordan won six NBA Championships, made fourteen NBA All-Star appearances, and won five NBA most valuable player awards. He was Defensive Player of the Year in 1988. Jordan is the most decorated player in the NBA, past or present. He won all of his games in the NBA Finals in which he participated except one. Jordan went to the Olympics a second time as part of the “Dream Team” that included Magic Johnson, Scottie Pippin, and Larry Bird. They won the gold medal at the 1992 Olympics in Barcelona, Spain. Sports Illustrated Magazine presented Michael Jordan as the greatest athlete of the past 50 years in their 1996 edition. From the results of a survey of athletes, journalists and other sports figures, ESPN ranked Jordan the 20th century’s greatest North American athlete, even over sports icons Muhammad Ali and Babe Ruth. He is indisputably one of the NBA’s all-time greatest players. Jordan’s number 23 is so iconic other athletes in different sports sometimes choose that number simply because it’s the same as Jordan’s. He was number 23 in high school and college as well as for his career with the Chicago Bulls. Only once did he wear another number when playing for them. On Valentine’s Day in 1990 a thief stole his jersey from the locker room before the game. Jordan tried on a fan’s replica jersey but it was too small. The equipment manager found an extra jersey that only had a number and no name on it. He was number 12 for the night and still scored 49 points. Beginning in November 1990, the Chicago Bulls and Jordan went eight years and never lost three games in a row. Ben Blatt of the Harvard Sports Analysis Collective re-figured his original estimate of the odds of this reoccurring to be one out of 140. It was an amazing accomplishment for Jordan and the team that included 500 regular season games and 126 games in the playoffs. When Michael Jordan won back-to-back slam dunk contests, a photographer’s picture of him as a solitary figure soaring up in a leap with a basketball in his hands became a poster that immortalized the athlete in many a child’s bedroom. Thus Michael’s Air Jordan trademark became a legacy. Jordan’s persona made him a star as well. He starred first in the 1996 feature film Space Jam in which he played himself. This movie mixed animation and live action and included cartoon legends Daffy Duck and Bugs Bunny. Michael Jordan was a cartoon superhero in a short-lived series called “ProStars” with Bo Jackson and Wayne Gretzky. It ran for two seasons in the early 1990s and featured the three sports stars saving the world from bad guys while living in a gym. The stars would do real life questions and answers within the cartoon although they did not voice their characters themselves. A few episodes can still be seen on YouTube. He’s also mentioned in other movies such as “Mike”, about a boy who gets Jordan’s old basketball shoes and magically starts playing basketball like him. Jordan has his own line of sport shoes called Air Jordan. They were introduced in 1985 and remain popular today. He makes around $60 million annually from Nike and Jordan brand royalties. Today Nike’s Jordan Brand generates $1 billion in sales. Jordan’s deal with Nike almost didn’t come to fruition. Michael wanted to wear Adidas and was also offered a deal to endorse a small brand called Spot-Bilt. Nike offered a then-enormous deal of $500 grand annually for five years. They also promised to tailor the sneaker to Jordan’s liking. Jordan still wanted Adidas and went to them once more. They could in no way match Nike’s offer though. So Jordan and Nike struck a deal and the rest is marketing history. Nike launched Air Jordan and by the end of 1985 the line had earned more than $100 million in revenue. An ironic note is that Jordan didn’t care for his first shoes, the Air Jordan I. He soon changed his mind when he realized the shoes distracted the other players. Eventually Jordan challenged basketball by wearing his beloved black and red Air Jordan sneakers. They were against the NBA dress code. Jordan paid every fine for wearing them from his Nike’s endorsements. Today, even all these years after his retirement, he is still of the world’s top 50 highest paid athletes. Before 1997, Jordan never earned more than $4 million in a season playing basketball. He was the league’s highest paid player in only two of his seasons. In 1997 he was paid $30 million and in 1998 he was paid $33 million. Jordan has also enjoyed endorsement deals with brands like Gatorade, Coca-Cola and Hanes and has been featured in their series of commercials. Michael Jordan also is affiliated with several restaurants, including the Michael Jordan’s Steakhouse in Grand Central Station Terminal in New York City. From 2004 until the end of 2013 he owned Michael Jordan Motorsports. This company had a professional closed-course motorcycle racing team. They competed in the AMA sanctioned Superbike Championship with two Suzukis. Jordan bought a share of his home state’s Charlotte Bobcats, nee Hornets, in 2006, and joined its executives as managing member of baseball operations. The Hornets had gone to New Orleans. In 2010 he became the majority owner of the Charlotte Bobcats and when the name became available as the Hornets became the Pelicans, bought it back. Now he is the head of basketball operations for the Charlotte Hornets and improving the teams’ record is his number one goal. He is the first former NBA player to become the majority owners of an NBA team and the only African-American majority owner of any NBA team. He joined the Forbes’ list of international billionaires in 2015, the first professional athlete to achieve this level of success. Jordan is also a noted philanthropist. He sponsored his Michael Jordan Celebrity Invitation Pro-Am Golf Tournament in Las Vegas for fourteen years from 2001 to 2014 and is said to be searching for property in Florida on which to develop his own golf club. He plays golf in celebrity charity tournaments that provide basketball scholarships while also donating to high schools, Habitat for Humanity, branches of the Boys and Girls Club of America, and other worthwhile projects. Jordan ate the same meal four hours before every game. He had a 23 ounce New York steak with a side of mashed potatoes or a baked potato with a salad and ginger ale. When Michael Jordan commissioned an artist to create a new dining room table, the artist constructed it from solid metal with many holes in it. There are 32,292 to be exact, one for every point he scored in his total NBA career. The infamous “Flu Game” in the 1997 NBA Finals in which Michael played while obviously very ill was probably not the flu after all. The night before the game, some of the players had ordered pizza delivered after the hotel’s food service ended for the night. When it arrived, five men delivered it. All the others were suspicious of it so only Jordan ate any. Then at two in the morning Jordan’s personal trainer was called to his room where he was doubled over in a fetal position with food poisoning. Bulls guard Ron Harper also claimed that “bad pizza” was to blame. In addition to golf, another of Jordan’s favorite hobbies is gambling. There are many reports of how he goaded all his teammates into betting on everything from card games to rock-paper-scissor contests. In 1993 Dr. Stanford Shulman treated a patient with salmonella. After testing and a check with the CDC, the doctor discovered that the strain of salmonella the patient had was previously undiscovered. The doctor was a huge Jordan fan with a stand-up poster of him in his office. He named the salmonella strain after the athlete: Salmonella mjordan. The late Kim Jong-il of North Korea was a huge Michael Jordan fan in the 1990s. He was given an autographed Michael Jordan basketball by Secretary of State Albright in 2000 that today sits in the Museum of International Understanding with a crocodile handbag from Castro and a rifle from Putin. One of the reasons Jordan was so successful as a product spokesman was that he had no visible tattoos when playing. He does actually have a tattoo, though, and it is the Greek letter Omega on his chest over his heart. It is to honor his commitment to his Omega Psi Phi Fraternity, the first predominantly African-American one to be established at a historically black university (Howard). In addition to the Chicago Bulls, the Miami Heat also retired the number 23 out of respect to Michael Jordan. His number was the first jersey the Heat ever retired. The ceremony took place on April 11, 2003 before the game between Jordan and the Washington Wizards, and the Miami Heat. The Wizards won the game. A pair of one of the earliest Jordan sneakers produced by Nike and worn by Michael brought over $71K at auction. Jordan states his most memorable dunk of all time was against his friend Patrick Ewing. He names Lakers player Jerry West as the athlete he most wants to play one-on-one. His full name is Michael Jeffrey Jordan and he is known to his friends as MJ, some of whom include Spike Lee and Oprah Winfrey. His best friend is a limousine driver he met when he arrived in Chicago for the first time in 1984. The Bulls didn’t remember to send someone to the airport to meet him and a driver named George Koehler offered to help him. George’s rider hadn’t shown up and George mistook Michael for his brother Larry Jordan, whom Koehler had gone to high school with. He only charged Jordan $25 to take him round the city. Eventually Koehler would become his regular driver and a lifelong friendship developed between the two men. They are still best friends. Michael Jordan was married to Juanita Vanoy for seventeen years and they have three children together: Jeffrey, Marcus, and Jasmine. They divorced in 2002, reconciled, then divorced again in 2006 for good. The divorce was on amicable and mutual terms. At that time, their divorce settlement of $168 million was the most expensive celebrity divorce in history. Jordan married model Yvette Prieto in April of 2013. She signed a prenuptial agreement before the wedding. Their twin daughters Victoria and Ysabel were born in February 2014. Michael’s Jupiter, Florida mansion houses a basketball court, eleven bedrooms, a pool house, guard house and guest house. Its personal movie theater was built to Jordan’s specifications to handle enormous amounts of cigar smoke. Jordan took up smoking in 1991. He used it to ease the stress of his long drives to the stadium before games. His coach didn’t mind the habit since it didn’t interfere with his performance for the team. Jordan’s father, James Jordan, was shot to death by two teenage thieves while he slept in his car. They dumped his body in a swamp in South Carolina, where it was discovered in Bennettsville. They were caught, convicted and sentenced to life in prison. His father’s murder was responsible for Jordan’s decision to switch to baseball, as his father had encouraged him to do for several years before his death. Although he left the University of North Carolina after his junior year, Jordan did receive his degree (in 1986) in cultural geography. Cultural geography is an introduction to meteorology and his backup career in case basketball didn’t work out was to be as a weatherman. Jordan decided to pursue a career in baseball, which was his father’s favorite sport, after the older Jordan’s murder in an armed robbery. Jordan became a rookie with the Birmingham Barons at the age of 31 in the 1994-95 seasons even though he had not played baseball since high school. The Barons were the minor league club for the Chicago White Sox, for whom Jordan played several games. Then he rejoined the Bulls from 1995-1998. Jordan retired the first time from basketball after his 1997-98 season then joined the Washington Wizards as president of basketball operations and a part owner. When he was relieved of his operations duties, he returned to the court in the fall of 2001 and played basketball two more seasons before finally retiring for good in 2003. He began his first season on the court with the Washington Wizards in September 2001. After 9/11 he donated his salary from his comeback to basketball to victims’ charities of 9/11. His career there was short-lived, as he injured his cartilage in his right knee. In April 2009, Michael Jordan was inducted into the Naismith Memorial Basketball Hall of Fame. He was inducted again in 2010 as a member of the 1992 United States Men’s Olympic Basketball Team (“Dream Team”) that won the gold medal. In 2015 Jordan became a member of the FIBA Hall of Fame. His first induction was bittersweet for Jordan, as it meant that his basketball career was completely over. He played pro basketball for a total for fifteen years. Jordan is the only basketball player aged 40 or older to average over 20 PPG and to score over 40 in a game. His name was placed with those of the top 50 NBA players of all time in 1996.